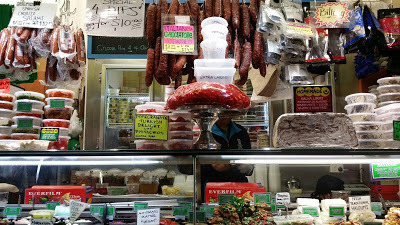 Having visited the Queen Victoria Market on many occasions, we decided to try their Ultimate Foodie Tour. Not having had breakfast, we did arrive at the meeting spot eating (the usual spicy hotdog with plenty of sauerkraut from the Bratwurst Shop and a delicious spinach and cheese borek from the Boreks Shop), much to the surprise of our guide who assured us there would be plenty of tastings. Right, so breakfast out of the way we had a quick introduction to how the tour would run and then with shopping bag in hand, we were on our way. Starting with a bit of history, we learnt that the Queen Victoria Market was officially opened on 20 March 1878 and a range of markets operated from the site prior to that date. In its 139 years, it has had a colourful and sometimes controversial history. During that time, the site has been a cemetery, a livestock market and a wholesale fruit and vegetable market. Yes, that's right, between 1837 and 1854, much of the land on which the Market now stands was the site of Melbourne's first official cemetery, which housed the remains of an estimated 10,000 early settlers, including those of John Batman. First stop was the meat and fish hall with all its smells and stall holders calling out the specials of the day. 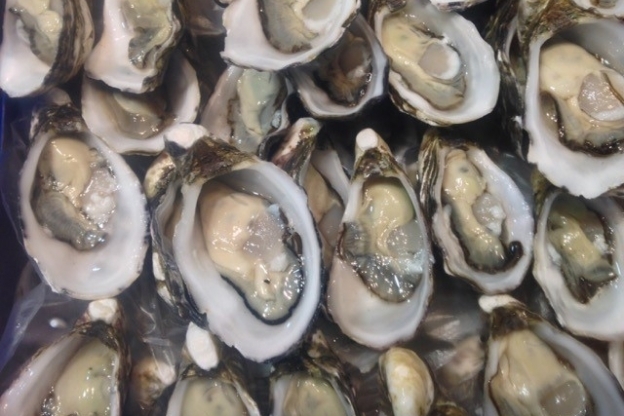 Started our tastings with a slippery freshly shucked oyster, learning a little about how to shuck them from the master. We learn about the metal hook and rail system above the shops and how at around 2am the meat is hoisted up and pushed around and delivered to the various stalls. The butchers enter later and get to work. Most of the pork sold is from female pigs. Apparently, it is sweeter and meat from male pigs is said to have a stronger, distinct smell. The offal shops are interesting, with tongues, kidney, liver, brains and every other bit imaginable available to buy. With today's move towards nose to tail cooking, nothing is wasted. One of the stall holders here tells us he has been working there for over 50 years! In fact, many of the stall holders have been around for a long time, like their families before them. Next, we walk into the stunning art deco design deli hall which is now a protected National Trust building. It was originally built to sell butter and cheese and the windows were built to face South to keep things cool. 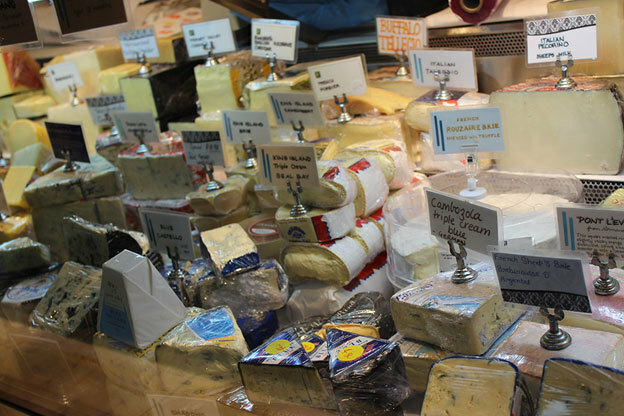 Once there were fourteen butter and cheese stalls, today only one butter specialist remains (Curds and Whey), although there are plenty of amazing cheeses available. Love how the stallholders and all the goodies still have to get in and out via the little hatches. 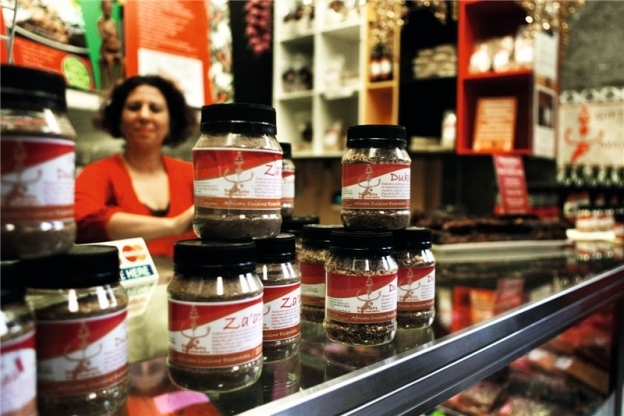 Stopped at Tribal Tastes - an African Deli operating since 2002. Here we tried some beef biltong, kangaroo biltong and candy salmon. 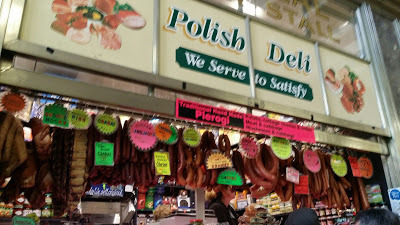 Next stops were to sample some cheeses, cured meats, antipasto dolmades and olives at the Queen Vic Deli and the Polish Deli . In our bags we had a bowl and fork and this was for the delicious pasta from The Traditional Pasta Shop, with its range of filled pastas – stuffed with delicious combinations, including fig, gorgonzola and prosciutto; and caramelised onion and goat's cheese. Yum! 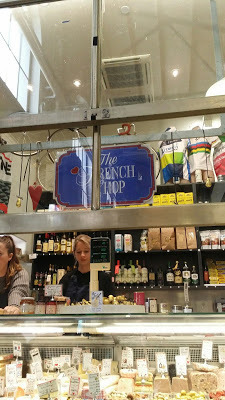 Right next door was The French Shop and here we tasted some pate and French cheeses. Obviously, the marketing teams for these shops kept things simple when coming up with a name. Which is great. Less confusion and you know what you're getting. 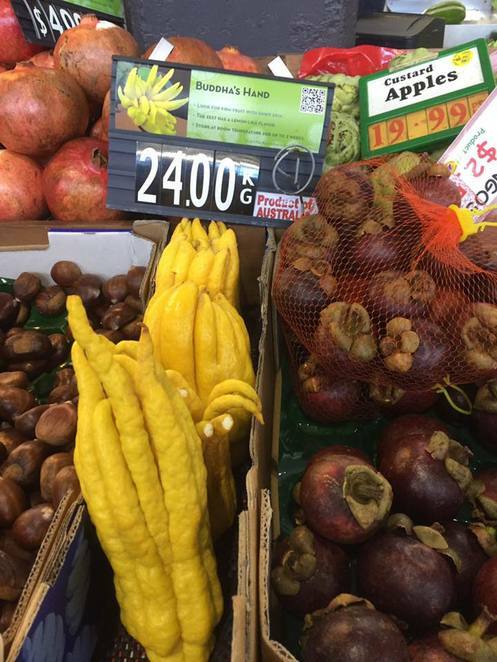 There are so many great smells and amazing produce that it's hard to know where to look. 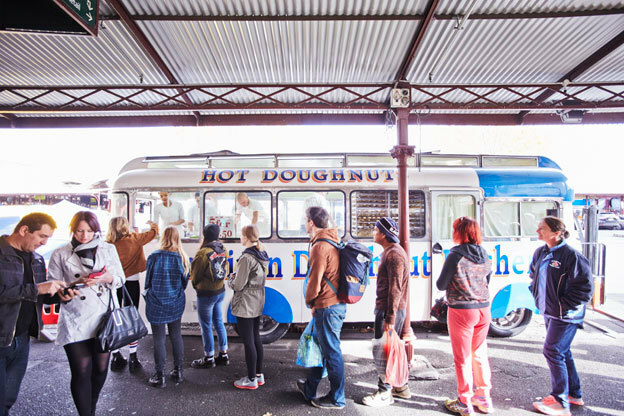 We pass through the organic fruit and veggie section and then on to the other must have at the QVM - a hot jam doughnut from the American Doughnut Kitchen van. 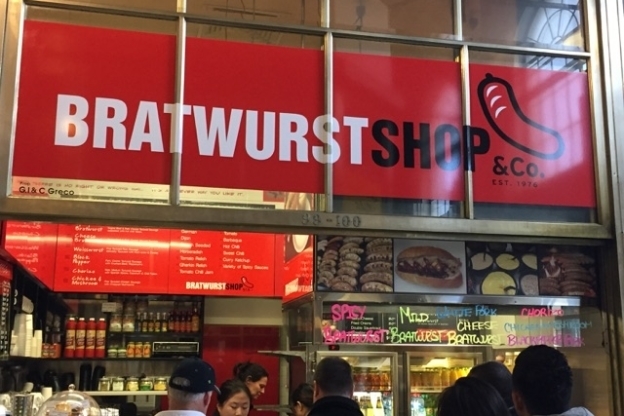 They've been operating here since 1950, and they serve 1000's of people every week with a recipe that has remained unchanged since they started. I love these sugary little beauties and probably being limited to just 1 was a good thing. Anyway, the lines are always long, but we got a shortcut to the window. Final stop was for some mulled wine and a fruit platter at ReWine. A very civilised way to end the tour. The tours are $69 each and depart at 9am and 11am on Tuesday, Thursday and Saturday. They last for around 90 minutes. You get a shopping bag and a $5 voucher to use at any of the stalls. The taste testings are enough to fill you up for lunch. Click here to book. 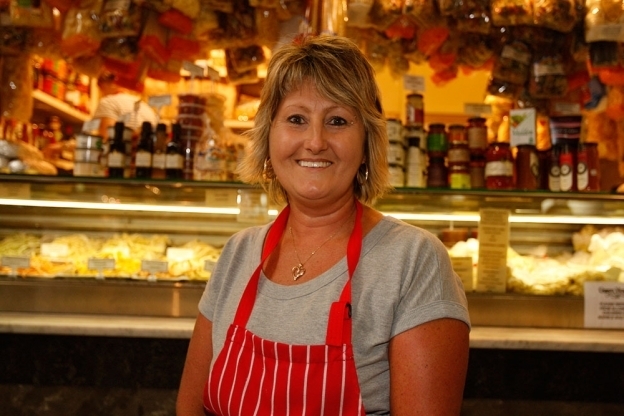 The tour is great for anyone wanting to hear some interesting stories about the Market's history, learn secret shopping tips and get to know some of our most beloved traders who have built the Queen Vic Market into the ultimate destination for foodies. By Tram: The Market is located within the free tram zone. Take the 19, 57 or 59 to Stop 7, Elizabeth St or Tram 58 to Stop 9, Peel St.
By Train: Only a 7-minute walk from Melbourne Central and Flagstaff Stations. Walk north along Elizabeth or William Street. By Bike: There is free bike parking in and around the Market. Major bike lanes leading to the Market run along Royal Parade and Victoria Street. By Car: Enter the market car park from Franklin or Queen Streets. 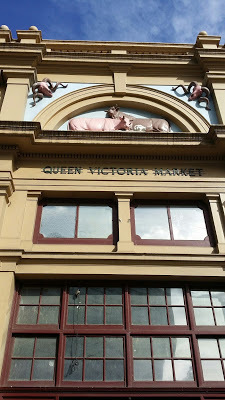 The Queen Victoria Market is closed on Monday and Wednesday. Click here for trading times on all other days.